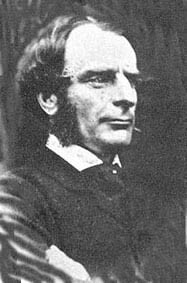 Charles Kingsley (June 12, 1819 – January 23, 1875) was an English novelist, particularly associated with the West Country and north-east Hampshire. In addition to his literary body of work, Kingsley was a Protestant priest, who gained prominence in the public arena as an activist for politics and social reform. His commitment to his social agenda manifested itself in his written work, not only in his many published letters, sermons, scientific essays, and lectures, but also as themes in his novels and historical works. An advocate of Christian socialism, he published several novels about social problems before writing the very successful historical novels Hypatia (1853), Westward Ho! (1855), and Hereward the Wake (1866). He was also one of the first clergy to support Charles Darwin’s theories and to seek a reconciliation between science and Christian doctrine. Darwin's theory of evolution inspired his popular children's book The Water-Babies (1863). His success gained him a professorship at Cambridge University. Later he was appointed canon of Chester Cathedral and then Westminster Abbey. He was also chaplain to Queen Victoria and tutor to the future King Edward VII. Charles Kingsley was born on June 12, 1819 in Holne Vicarage, near Devonshire. His father, Reverend Charles Kingsley, was from a line of country gentlemen, but he turned to the priesthood to support himself financially. His mother, Mary, was born in the West Indies of sugar-plantation owners. His brother, Henry Kingsley, also became a novelist. Kingsley spent his childhood in Clovelly and was educated at Bristol Grammar School. It was here in Bristol that he witnessed the 1831 Reform Bill riots, which he later counted as a defining moment in his social outlook. As a young student, Kingsley was enthusiastic about art and natural sciences, and often wrote poetry. When his father was appointed rector at Saint Luke's, Chelsea, the family moved to London, and the young Kingsley enrolled at King's College, where he met future wife Frances "Fanny" Grenfell—they married in 1844. In 1842, Charles left for Cambridge to read for Holy Orders at Magdalene College. He was originally intended for the legal profession, but changed his mind and chose to pursue a ministry in the church. With F.D. Maurice as his mentor, Kingsley believed that true religion must incorporate the social and political spheres of life, and thus, he worked tirelessly toward the educational, physical, and social betterment of his congregation. In 1844, he was appointed rector of Eversley in Hampshire. In November the same year, his first child, Rose, was born. His son Maurice followed in 1847, and daughter Mary St. Leger, who later authored novels under the pen name Lucas Malet, was born in 1852. In 1859 he was appointed chaplain to Queen Victoria. He also became a private tutor to the Prince of Wales, in 1861. 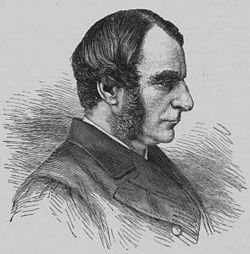 In 1860, Kingsley was appointed Regius Professor of Modern History at the University of Cambridge. In 1869 he resigned his Cambridge professorship and, from 1870 to 1873, was a canon of Chester Cathedral. While in Chester he founded the Chester Society for Natural Science, Literature and Art, which played an important part in the establishment of the Grosvenor Museum. In 1872, Kingsley accepted the Presidency of the Birmingham and Midland Institute, becoming its 19th President. In 1873 he was made the canon of Westminster Abbey. Kingsley died in 1875, and was buried in St Mary's Churchyard in Eversley. Kingsley's life was memorialized by his widow in 1877, in a book entitled Charles Kingsley, his Letters and Memories of his Life. Counting F.D. Maurice as a principal influence in his life, Kingsley committed himself to the Christian Socialist movement, alongside John Malcolm Ludlow and Thomas Hughes. His literary career would thoroughly display the social causes that he supported. One such work was Yeast: A Problem, featured first in Fraser's Magazine in 1848, before being published in book form in 1851. It underlined the plight experienced by agricultural laborers in England. His works Cheap Clothes and Nasty and "Alton Locke, Tailor and Poet shed light on the working conditions of the sweated tailors' trade. In 1849, Kingsley and his counterparts worked tirelessly to spread awareness of and aid to sufferers of the cholera epidemic sweeping London's East End. This paved the way to a lifelong dedication to teaching proper hygiene and sanitation to the masses, both publicly and in his novels. In 1854, he spoke before the House of Commons to promote public health reform. The subject of sanitary habits was also a main component of his children's novel The Water Babies. In addition to his commitment to social causes, Kingsley also was deeply invested in writing historical fiction, as shown in The Heroes (1856), a children's book about Greek mythology, and several historical novels, of which the best known are Hypatia (1853), Hereward the Wake (1865), and Westward Ho! (1855). His first major work under the genre, Hypatia, was issued in two volumes in 1853. Set just before the fall of Alexandria, Hypatia told the story of the various schools of thought in conflict, most notably the crisis between Christianity and Neo-Platonism. With his most popular historical novel, Westward Ho! Kingsley romantically depicted the divisions occurring within Christianity itself, between Protestant England and Catholic Spain. In this critically-praised adventure story, Kingsley's protagonist hero, Amyas Leigh, aids the English army in defeating the Spanish Armada. With Amyas, Kingsley created his representation of an ideal Elizabethan-age Victorian boy. Though the book was noted for its realistic descriptions, perhaps its fault was with its ethnic bias. Along with his Victorian themes, Kingsley also projected Victorian attitudes about race. Indeed, he once wrote to his wife, describing a visit to Ireland, "I am haunted by the human chimpanzees I saw along that hundred miles of horrible country. I don't believe they are our fault. I believe there are not only many of them than of old, but they are happier, better, more comfortably fed and lodged under our rule than they ever were. But to see white chimpanzees is dreadful; if they were black, one would not feel it so much, but their skins, except where tanned by exposure, are as white as ours." The public detected a possible shift in Kingsley's political attitudes, with the publication of Two Years Ago (1857), a novel for adults, replete with the themes of sanitation reform, the abolition of slavery, and the importance of scientific study. It seemed that by focusing less on the plight of laborers, Kingsley was positioning himself further from the Christian Socialist cause that he once represented. In turn, the novel caused him to be associated with the doctrine of "muscular Christianity." The phrase "muscular Christianity" apparently first appeared in an 1857 English review of his novel Two Years Ago (1857). One year later, the same phrase was used to describe Tom Brown's School Days, an 1856 novel about life at Rugby by Kingsley's friend, fellow Englishman Thomas Hughes. Soon the press in general was calling both writers muscular Christians and also applying that label to the genre they inspired: Adventure novels replete with high principles and manly Christian heroes. His most pressing scientific and educational views and his concern for social reform are illustrated in his most famous work, the children's classic The Water-Babies (1863), a kind of fairytale about Tom, a poor boy chimney-sweep. Originally intended as a short story written for Kingsley's youngest child, the novel chronicles the rebirth of Tom as a water-baby and his subsequent adventures alongside many different creatures. It has been noted that in The Water-Babies, Kingsley wrote of something of a purgatory, which ran counter to his "Anti-Roman" theology. The story also mentions the main protagonists in the scientific debate over Charles Darwin's On the Origin of Species, gently satirizing their reactions. Holding the belief that nature was imbued with a cathartic spirit, he was sympathetic to the idea of evolution, and was one of the first to praise Darwin's book. He had been sent an advance review copy and in his response of November 18, 1859 (four days before the book went on sale), stated that he had "long since, from watching the crossing of domesticated animals and plants, learnt to disbelieve the dogma of the permanence of species." Darwin added an edited version of Kingsley's closing remarks to the next edition of his book, stating that "A celebrated author and divine has written to me that 'he has gradually learnt to see that it is just as noble a conception of the Deity to believe that He created a few original forms capable of self-development into other and needful forms, as to believe that He required a fresh act of creation to supply the voids caused by the action of His laws'." 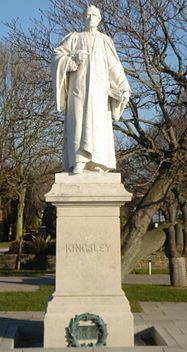 During his remaining years, Kingsley continued to write poetry and political articles, as well as several volumes of sermons. His famous ongoing dispute with the Venerable John Henry Newman, was made public when Kingsley ran a letter in Macmillan's Magazine, accusing Newman and the Catholic Church of untruthfulness and deceit, prompting a subsequent public battle in print. Newman defeated Kingsley with poise and intellect, exhibited in his Apologia Pro Vita Sua, which clearly showed the strength of Kingsley's invective and the distress it induced. Kingsley published his last novel Hereward the Wake, "Last of the English" (1866), noted by critics as his least successful in execution, and surprisingly lacking in its social and philosophical statements. Publication of several articles and lectures followed each of his tours of the West Indies and the United States, before he finally succumbed to poor health. Though he is forever tied to his religious and social activities, Kingsley was nevertheless remembered as a writer. As a novelist his chief power lay in his descriptive faculties. The descriptions of South American scenery in Westward Ho! of the Egyptian desert in Hypatia, of the North Devon scenery in Two Years Ago, are brilliant; and the American scenery is even more vividly and more truthfully described when he had seen it only by the eye of his imagination than in his work At Last, which was written after he had visited the tropics. His sympathy with children taught him how to secure their interests. His version of the old Greek stories entitled The Heroes, and Water-babies, and Madam How and Lady Why, in which he deals with popular natural history, take high rank among books for children. Kingsley's impact at times transcended the literary world. His novel Westward Ho! led to the founding of a town by the same name and even inspired the construction of a railway, the Bideford, Westward Ho! and Appledore Railway. Few authors can have had such a significant effect upon the area which they eulogized. A hotel in Westward Ho! was named for him and it was also opened by him. Another hotel was opened in 1897, in Bloomsbury, London, and was named after Kingsley. The owners were tee-totalers who admired Kingsley for his ideas on political and social reform. The hotel was renamed the Thistle Bloomsbury in 2001. ↑ 1.0 1.1 Christine L. Krueger, Encyclopedia of British writers, 19th century, (Facts on File, 2003, ISBN 978-0816046706). ↑ Information Sheet: Charles Kingsley. Cheshire West and Chester. Retrieved 19 April 2010. ↑ Bmi.org, Birmingham and Midland Institute. Retrieved October 20, 2007. ↑ L.P. Curtis, Jr., Anglo-Saxons and Celts - A Study of Anti-Irish Prejudice in Victorian England (Bridgeport, CT: The Conference on British Studies at the University of Bridgeport, Connecticut, 1968), 84. ↑ Infed.org, Muscular Christianity. Retrieved October 20, 2007. ↑ Darwin Online. Retrieved September 21, 2007. Darwin, Charles. On the Origin of Species by Means of Natural Selection, or the Preservation of Favoured Races in the Struggle for Life. London: John Murray, 1860. Rapple, Brendan A. Dictionary of Literary Biography, "Volume 163: British Children's Writers, 1800-1880." Morgan State University, 1996. Uffelman, Larry K. "Charles Kingsley: A Biography". The Victorian Web. Charles Kingsley: His Letters and Memories of His Life Books.google.com. Madam How and Lady Why Mainlesson.com. This page was last modified on 3 February 2017, at 15:42.